Curly Black Walnut is a rare find, indeed. It's the stuff of heirloom instruments and furniture, thus it is more expensive than plain Black Walnut. 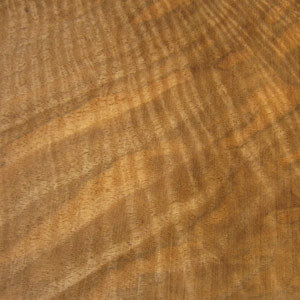 Curly Black Walnut is called curly because of the wavy figured pattern that appears perpendicular to the growth rings. Except in stump wood, the curly figure seems to be completely random. Like plain Black Walnut, it is a heavy and dense wood with silica in it that can make it difficult to saw and plane. But its texture is even and it can be polished to a high or lustrous sheen. Also like Black Walnut, it is a skin sensitizer and must be handled and worked with appropriate care.